Crowborough01892 653311work TownCrowborough is the largest and highest inland town in East Sussex, set within the High Weald Area of Outstanding Natural Beauty and bordering the Ashdown Forest, a site of European significance for birds and heathland. It is also famous as being the setting for A.A.Milne's wonderful Winnie the Pooh books. The gorgeous countryside around the town is a walkers' paradise and there are also facilities nearby for horse riders, cyclists and rock climbers. Crowborough is situated just south of Tunbridge Wells on the A26, about halfway between London and the coast, and can also be reached by train on the Uckfield line from London Bridge. 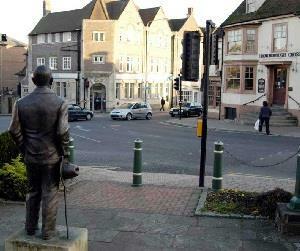 Its most famous resident was Sir Arthur Conan Doyle, of Sherlock Holmes fame, commemorated by a statue now standing at the main crossroads in the town. The bustling town centre has excellent supermarket provision and numerous small, independent retailers, restaurants and cafés. There is a farmers' market once a month and the luxury of plentiful free parking. The town also possesses an excellent caravan and camping site within walking distance of the town centre which is situated right next to the leisure centre and recreation ground; facilities on offer here include a swimming pool, gym, sports hall, children's playground, model railway, skateboard park and petanque piste. Other attractions that Crowborough can offer visitors include a country park, a thriving arts culture and various annual events including the Summer Fair, Christmas Event, traditional torchlight parade and carnival in September and the amazing (and free!) Firework Display on 5th November. Crowborough is the largest and highest inland town in East Sussex, set within the High Weald Area of Outstanding Natural Beauty and bordering the Ashdown Forest, a site of European significance for birds and heathland. It is also famous as being the setting for A.A.Milne's wonderful Winnie the Pooh books. The gorgeous countryside around the town is a walkers' paradise and there are also facilities nearby for horse riders, cyclists and rock climbers. Films, plays and concerts are shown regularly at the Crowborough Community Centre http://www.crowboroughcentre.info/ which also has a purpose built dance studio and an excellent cafe. Art and photographic exhibitions are also a regular feature.